People come from around the world each year to visit the forests of East Tennessee. These forests are known for species diversification and brilliant tree specimens. The trees of East Tennessee help identify the region as thriving in natural resources and rich from the benefits those trees provide. East Tennessee is where northern deciduous forests meet the southern temperate forests, and various precipitation patterns occur over a range of altitudes which makes the City of Knoxville a perfect environmental canvas for a distinguishing urban forest. 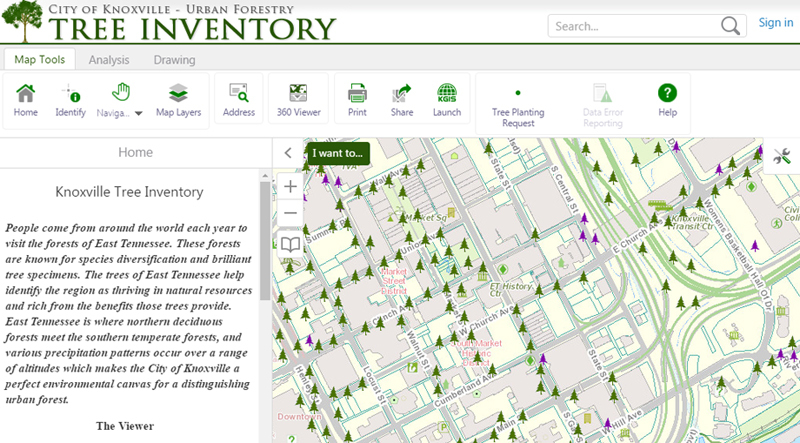 The concept of Urban Forestry is not new to Knoxville. The City of Knoxville and local folks have been planting trees for years for multiple reasons. Through time, the understanding of tree benefits and the importance of trees has greatly evolved. Trees are no longer only valued for their beauty and shade, but a new wave of environmental,economic, and social benefits are being recognized. Trees are one of the few City assets that increase in value through time. The City of Knoxville has recognized the importance of properly investing in trees,and has developed an Urban Forestry Division through the Public Service Department to plant, manage, and protect these valuable assets. • Trees improve city aesthetics! What does the Knoxville Tree Board do in your community? Would you like to learn more about trees from famous musicians? Click here to learn more about "If Trees Could Sing"